Sonogashira coupling of two different diketopyrrolopyrrole (DPP)-containing dihaloarenes with the same aromatic bisalkyne resulted in two new conjugated polymers with the same backbone but different pendant groups on the DPP moiety. The polymers were found to have designed chemical structures via structural characterizations in comparison with three monomers. 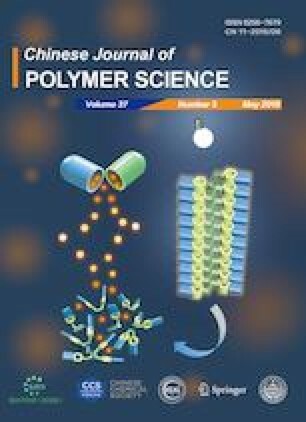 The molecular weight measurement further demonstrated the formation of polymers with polydispersity index around 2, consistent with the polycondensation nature of the polymerization based on Sonogashira coupling. Both polymers could dissolve in many organic solvents, and the one with long alkyl side group on DPP moiety had better solubility. Photophysical investigation showed that both polymers had typical absorption/emission of conjugated polymers, and varying the solvent did not have large influence. Compared with other polar solvents, toluene reduced the quantum yield of fluorescence of the polymers, especially for the one with long alkyl pedant group, accompanying with slight red-shift in absorption/emission. The difference in the absorption/emission wavelengths between the polymers was similar to that between the corresponding monomers. Adding water into the THF solution of polymers reduced the emission intensity but no redshift was observed. Discussion about the structure-property relationships was carried out in detail. Supplementary material is available for this article at https://doi.org/10.1007/s10118-019-2248-6 and is accessible for authorized users. This work was financially supported by the Natural Science Foundation of Jiangsu Higher Education Institutions (No. 18KJA430014), the Natural Science Foundation of Jiangsu Province (No. BK20181441), and the Priority Academic Program Development of Jiangsu Higher Education Institutions (PAPD).